The development and delivery of child care services in Canada has never been without controversy. Although stakeholders from opposing spheres of influence have battled for divergent demands, the concept that some form of support for child care falls within the realm of state responsibilities has been acknowledged for many decades. In the 1990s, a political swing to the right is precipitating a reassessment of this principle. Child care advocates are finding that traditional goals for state support such as enhanced services, improved conditions for workers, increased accessibility, and higher standards of care are becoming secondary to fundamental debates about the need for any form of state intervention in services. 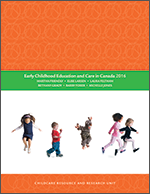 This paper describes the development of the child care system in the province of Alberta, shows how the role of the state (government) proceeded through four distinct phases, each determining a different outcome for child care stakeholders. Under the tenets of neo-conservatism, the current fifth phase is redefining the child care paradigm. To the extent that the example of Alberta serves as a prototype of child care developments elsewhere, the analysis of developments and outcomes can assist in forewarning those who are concerned about the maintenance and development of public child care as we know it.